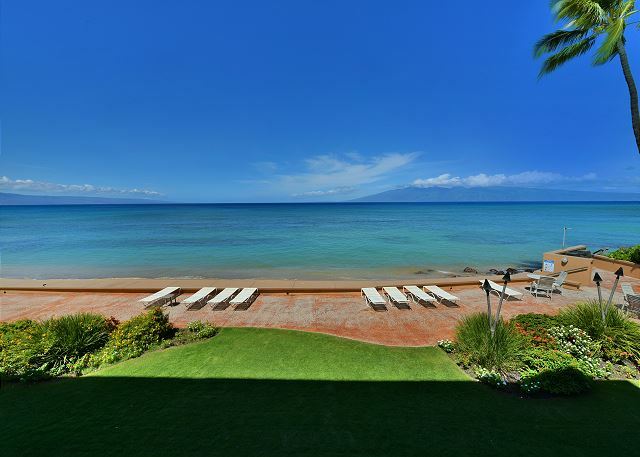 Makani Sands Unit #208 is your home away from home while on Maui. 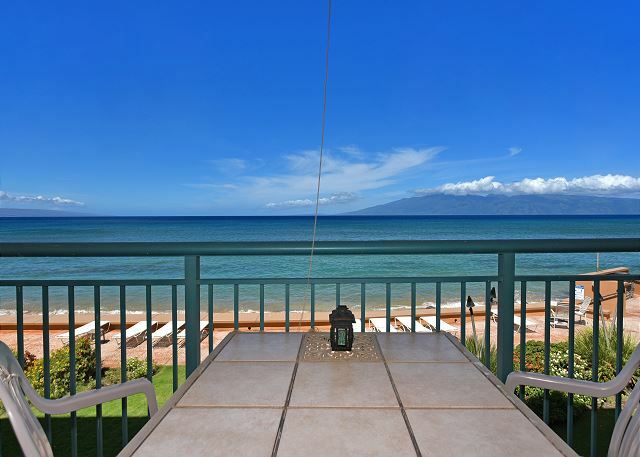 This one bedroom condo has a beautiful view of the ocean, as well as our neighboring islands of Molokai & Lanai. Condo has bamboo floors in the living room, and a large wrap around couch with a sofa bed. 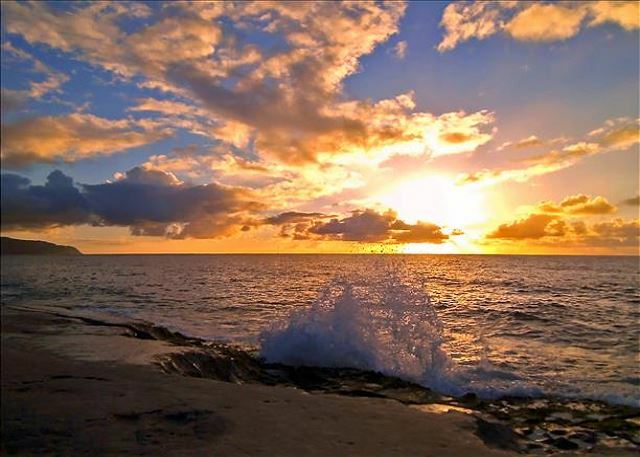 You can sit on your lanai and have your morning coffee, or watch the sunset over the ocean. This condo has a full kitchen, recently remodeled, with all the necessary appliances The bedroom has a King bed, and There are two TVs, one in the living room, and one in the bedroom. There is a stereo, CD and DVD for your enjoyment Ask for Makani Sands #208, and enjoy your stay on Maui. 2 guests only please! There is a stereo, CD and DVD for your enjoyment Ask for Makani Sands #208, and enjoy your stay on Maui. Eight days of relaxation in this quiet slice of paradise was not nearly enough. My wife and I love this location and the small size of the property. The small beach is great for a nice cool swim and watching the endless amount of turtles swimming by. You can't go wrong here. 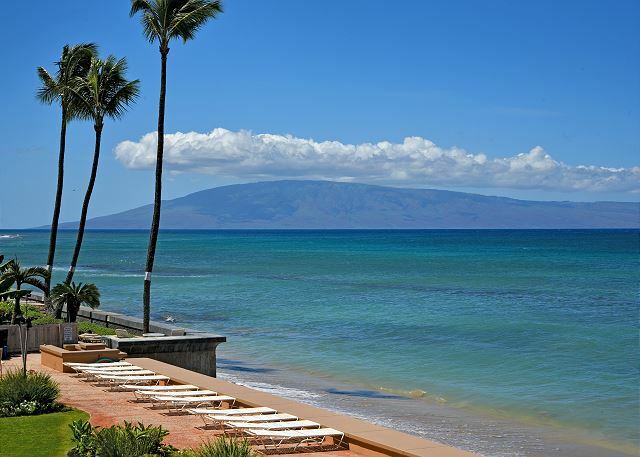 We have stayed at Makani Sands for many years and feel at home at this resort. We have stayed in 5 or 6 different units, all very comfortable and a totally awesome ocean view with whales breaching and turtles swimming right out front. Highly recommended Makani Sands! Louise R from Surre, BC does not recommend this vacation rental. Mother Nature is the only one making an effort here! Linens need replacing, pillows are as old as the hills, the fridge leaks, 6 wine glasses all different, bare minimum in the kitchen and the sofa should be put out at the bus stop. It was just what I needed. It’s quiet and the view is beautiful. The room was very clean, has a full kitchen, close to stores and yet far enough for your stay to be quiet. I recommend Makani Sands to anyone. We rented Makani Sands when our original condo was found to be uncleaned from previous tenants. We were so happy with our stay at Makani Sands. The manager was very kind and helpful. The unit was lovely and we "survived" the hurricane winds with no problem. The turtles were amazing!! a guest from Gravois Mills, MO does not recommend this vacation rental. The location was very good, close to everything we needed. The only criticism is the unit had no air conditioning, and it was Hot! In 2018 it's hard to believe a rental unit would not have air conditioning. My wife and I LOVE this place! Perfect!! Exceptional value, relaxing, comfortable, great property, quiet and amazing sunsets are a few words my wife and I would use to describe this wonderful place. We will be back soon! had a great time. Not much sun for the two weeks were there but still 82 everyday. Lots of walking on beaches close by and great snorkeling. Barbequed every night standing 10' from the ocean. Awesome views, great condo. Highly recommend this complex. Very nice condo. All that you could need and the views were just awesome with sightings of turtles everyday. Was sad that the sandy shore was no longer visible as it had been washed away but you could still enter the ocean via the stairs just being careful of the rocks but it was because of those rocks that all the turtles came around to feed off so that was a win win. The grounds are well kept and the management are very nice and welcoming. This condo complex is very centrally located with easy walking to the farmers market, restaurants, Bad *** coffee house and the ABC Store. Especially loved the sectional couch as it was comfortable (according to my BFF traveling pal) who slept there listening to the water crashing on the wall. We can a great time. What I would suggest is putting up umbrellas on the tables so that you can have some escape from the sun as there are no palms trees to provide shade as there are at some of the other complexes. But other than that great vacation. Thank you. The location of the condo is very convenient. Unfortunately, the strong waves have eroded the beach in front of the condo, and along most of the ocean front condos in the area. The condo was clean and maintained, with a newer kitchen and appliances,although the living room sectional was faded and dated. The bedroom had good storage and the mattress was supportive and comfortable. Customer service was prompt and pleasant. The ocean view is mesmerizing! We saw whales every day! 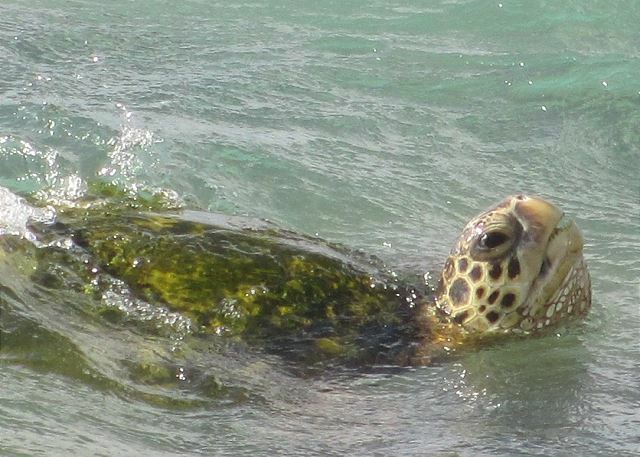 Turtles were frequently sighted swimming along the seawall. We had a great time. Great weather, great whale viewings. This condo was very clean and well taken care of. I would definitely stay there again. My husband and I stayed at the Makani Sands for nine nights. We loved that this condo was oceanfront and that the accommodations were very comfortable. The only drawback is that for about two hours in the afternoon while the sun is setting the condo becomes uncomfortably warm as there is no air conditioning. 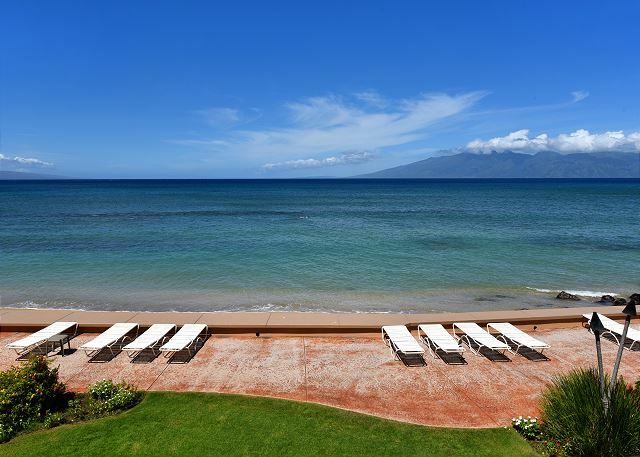 We've vacationed at Makani Sands for more than ten years and we keep coming back. Roseanna, and now Marie, are a big reason for that. The ocean is exquisite and the units are special. We will be back. My husband and I travelled to Maui meeting up with friends at Makani Sands. Everything about our stay was wonderful - our unit had everything we could ask for. Loved the views from the lanai - called it Whale TV for all the sightings. Access to so much that we wanted to do. Will definitely come back. Malhalo to Marie and Bert. Also Malhalo to Rob and family for providing a lovely condo for our stay. This was our fifth visit to the Makani Sands, and our second stay in this unit. 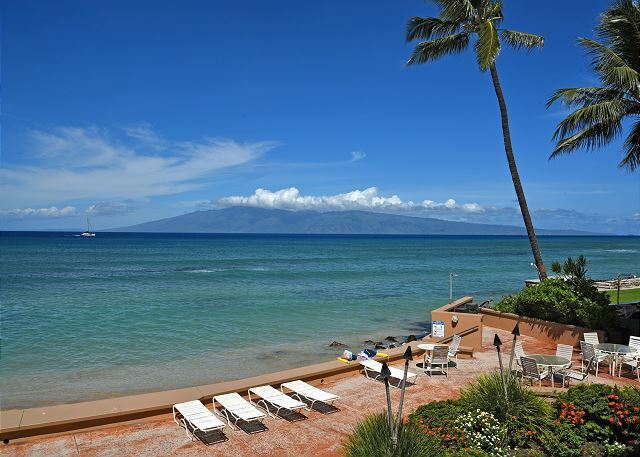 The ocean views are gorgeous and during whale season, they are seen right from the lanai. There were many turtles this year, too. The condo is adequately equipped with everything we needed for our stay. The bed is starting to feel as though it needs to be replaced and the hide-a-bed is truly uncomfortable. The only issue we have with this unit - and why we won't rent it again - is the upstairs neighbours. Last year, we had to contend with a group who smoked on the lanai, even though smoking is prohibited around the building. After they left, a group of women came in and they are *loud*. The condo above is privately owned and not a rental unit, so it seems as though the owners (and their adult children) feel the rules don't apply the same to them. We love this building and location, and we will be back - just not anywhere neighbouring the upstairs unit. This is the fourth year we have stayed at Makani Sands, and we love the location. The unit we stayed in this year needs some TLC, but we had a wonderful time. We loved Makani Sands! We spent hours sitting on the lanai watching whales and turtles play in the ocean. We also enjoyed swimming, snorkeling, and boogey boarding in the ocean off the sand beach. The neighboring condos don't have a beach so this was a big plus! The condo itself was clean, comfortable, and conveniently located. We used the nice Oceanside grills almost everyday and they light tiki torches each evening which provided great atmosphere. Roseanne in the office was also very helpful. She was able to get us whatever we needed to make our stay just perfect. We will definitely stay here again! We stayed to appear on a race. A kitchen and a washing machine came in handy very much. During staying, a staff didn't enter an interior, so it was quite possible to relax. Loved the unit and especially the sectional couch. Great Condo - Million Dollar View! Stayed at Makani Sands from June 8 to June 15, 2015 in Unit 208. Made our reservation online and Roseanna , the manager, contacted us by phone to confirm. All our dealings with the office were friendly, professional and efficient. The condo itself is perfect for 2 , contains 5 appliances and is clean and comfortable. The WiFi is strong and dependable. The "star" feature of the condo as well as all the condos iin this property is the view. We spent hours sitting and gazing out over the ocean towards the two smaller islands. Sunset and stargazing are great ways to end the day. The small beach in front allows easy access to the water for swimming and snorkelling. We never used the pool but it looked clean and well maintained. Several restaurants are within a mile of MS as well as anABC store and a full service grocery store. 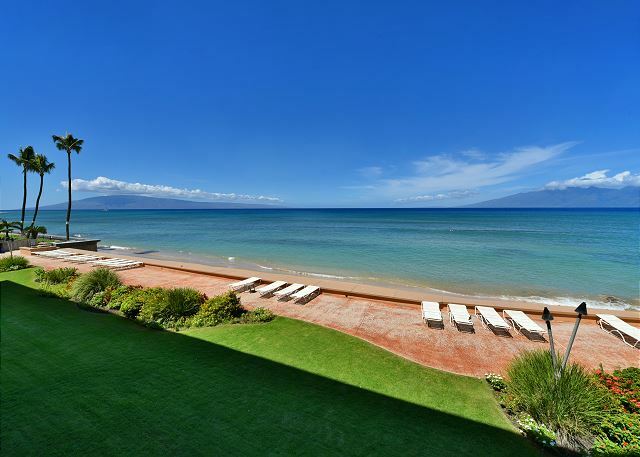 There are many condos in Maui to choose from but in terms of price, location and friendly, helpful staff you can't go wrong in booking Makani Sands! Did I mention the view? 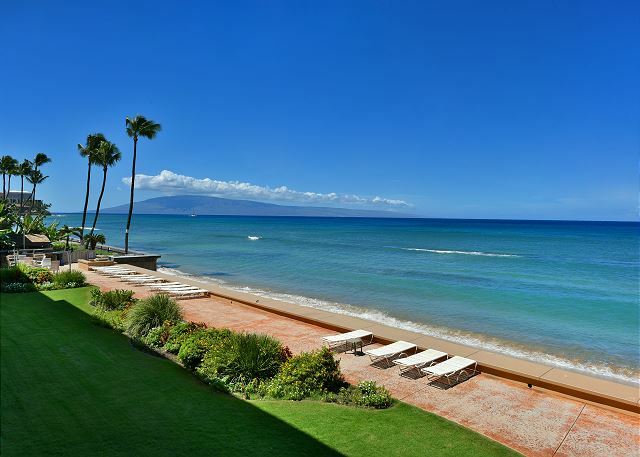 We so enjoyed the location--a lanai so close to the ocean. Watching whales and sea turtles. The sound of the ocean was so relaxing. The 60 years birthday celebration turned out to be "another honeymoon".